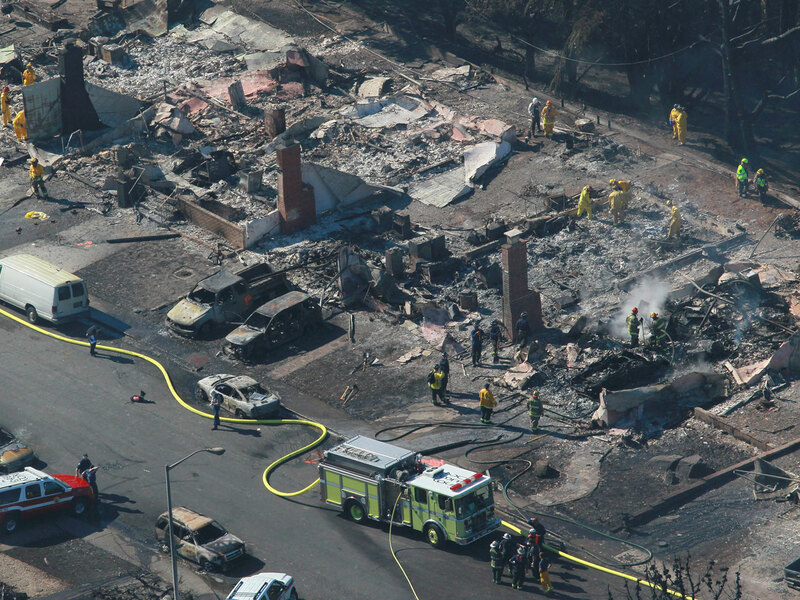 SAN FRANCISCO - A federal grand jury charged Pacific Gas & Electric on Tuesday with lying to federal investigators in connection with a fatal pipeline explosion that killed eight people and leveled a suburban Northern California neighborhood in 2010. The U.S. attorney in San Francisco announced the obstruction of justice charge and 27 related counts, which are in a new indictment charging the utility with felonies. It replaces a previous indictment that contained 12 counts related to PG&E's safety practices, but not obstruction. Prosecutors say PG&E hampered the investigation by lying to National Transportation Safety Board investigators after the blast. In particular, PG&E officials are accused of trying to mislead the NTSB about the pipeline testing and maintenance procedures the utility was following at the time of the explosion and for six months after under a company policy that did not meet federal safety standards. "The consequence of this practice was that PG&E did not prioritize as high-risk, and properly assess, many of its oldest natural gas pipelines, which ran through urban and residential areas," the U.S. attorney's office said in a statement. NTSB investigators later found that PG&E had inaccurate records on its more than 6,000 miles of gas transmission lines, and that as a result hadn't tested for the defective seam weld that ruptured a pipeline and ignited the fireball that leveled several blocks and left eight people dead in San Bruno. No employees or executives have been charged in the San Bruno disaster. Prosecutors could still file another indictment charging individuals. "However, based on all of the evidence we have seen to date, we do not believe that the charges are warranted and that, even where mistakes were made, employees were acting in good faith to provide customers with safe and reliable energy," he said in a prepared statement. The new charges expose PG&E to more than $1 billion in fines. It had preciously faced up to a $6 million fine under the old indictment. In addition, the utility is facing lawsuits and $2.5 billion in civil fines from regulators, including the state Public Utilities Commission. San Bruno city officials on Monday demanded the head of the PUC resign, alleging the agency had improper contacts with PG&E. Along with causing the deaths, the explosion injured dozens and destroyed 38 homes. Nearly four years later, the neighborhood about 12 miles south of San Francisco is still recovering. "What the U.S. prosecutor is saying is that PG&E did not use the proper procedure under the law for evaluating the integrity of their pipelines," San Bruno City Manager Connie Jackson said. "On top of that, they represented to NTSB that the procedure they were using was correct and approved" when it wasn't. On Tuesday, San Bruno Mayor Jim Ruane said "the new criminal charges demonstrate a pattern of deceit by PG&E."